Electric Baseboard Heater. Image courtesy of Cadet Heat. Even though electric baseboard heaters work on resistance heat which does not have the leveraging effect of a heat pump, they have certain advantages that make them a good choice for auxiliary heat in some circumstances. They can provide heat to a space where ducting, hydronics or even a heat pump head cannot be located. Think: the tiny entryway mud room that doesn’t need much heat, or a utility closet that needs to be maintained above freezing when the rest of the home is being heated by a wood or pellet stove. 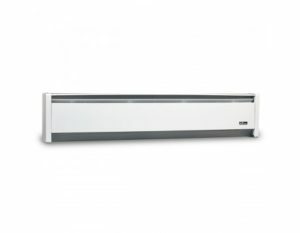 Electric baseboard heaters come in various lengths and outputs, and provide high temperature heat, as opposed to heat pumps which typically run just above ambient temperature. They provide an almost instant heat and each unit can have its own thermostat with a setback option. Electric baseboard heaters are 100% efficient, meaning that all of the energy supplied to the heater as electricity is converted to heat. Nonetheless, given the cost of kW hours versus combustion BTUs (from oil, gas, or wood pellets) they are typically the most expensive kind of heat. For anyone who oversized their net-metered solar array and has large credits, electric baseboard (and other electric heat emitters) can be used to offset other heating fuel usage.